Setting on for a trip to Israel and somehow there is not enough information to make you feel comfortable about the journey to the Holy Land? 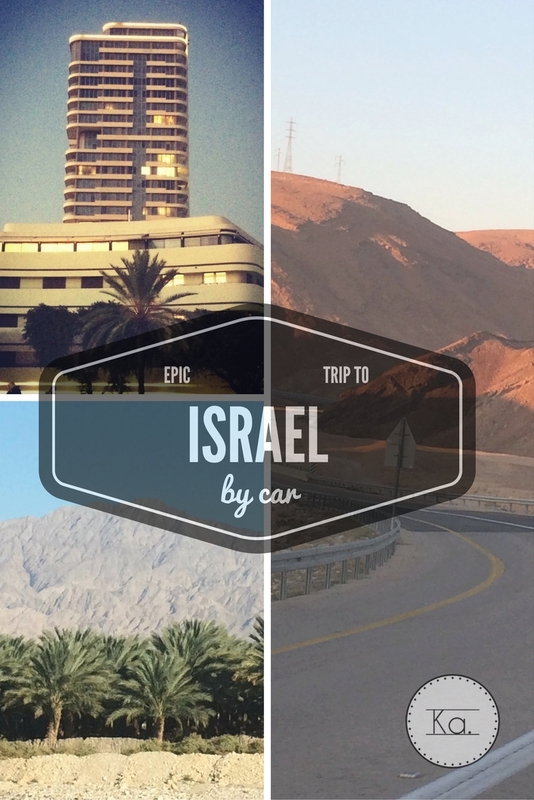 Search no more, because this is the guide to make the most out of your visit to Israel. The easiest way is to reach Israel by air. Many people land in Tel Aviv Ben Gurion Airport, but this is not the only international airport you can end up in when flying to Israel. There is also Ovda International Airport (VDA) – a tiny airport in the south of the country, which used to be a military airport, but now it serves also other, mostly low-cost airlines such as Ryanair, Monarch or Finnair. There are direct flights from Ovda to Bratislava, Budapest, Helsinki, Kaunas, Krakow and London. The distance between Eilat and Ovda airport is around 60 km (37 miles). You can get a shuttle to go to Tel Aviv or Jerusalem, ride a bus to Eilat or use the power of sharing economy and ask some of the local Israelis that were with you on the flight to give you a ride. Yes, these cheap flights to Israel are also used by the locals to travel to Europe. 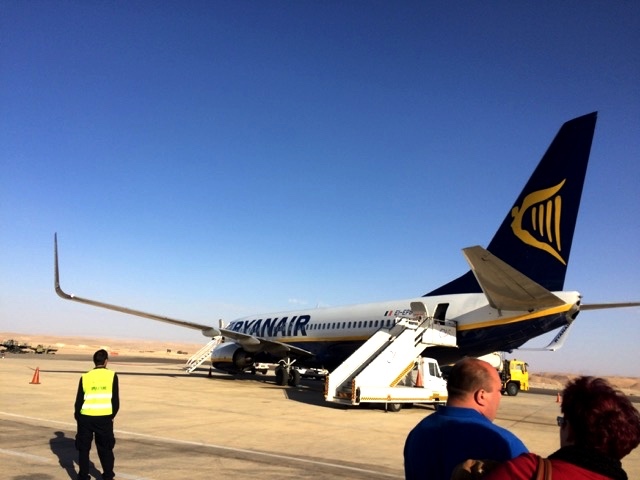 We took advantage of cheap flights to Israel offered by Ryanair. The return ticket was just 40 EUR. When I saw this promotion, I booked it immediately. 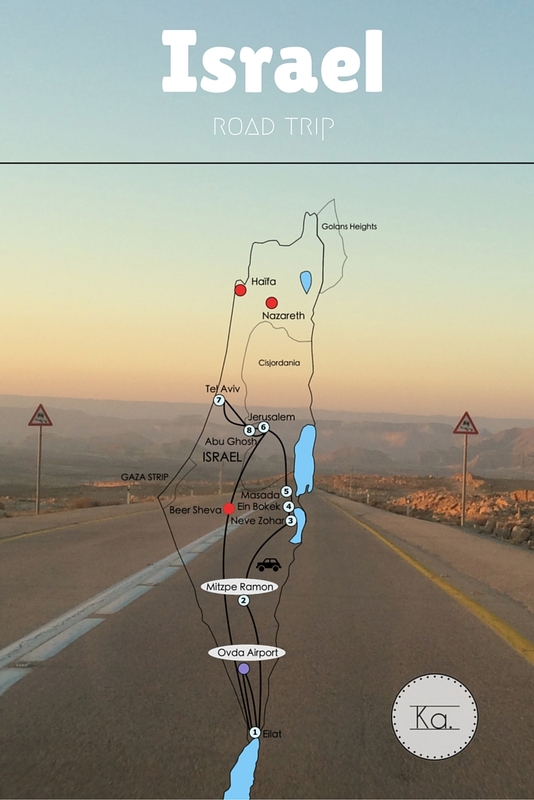 As we were embarking on a road trip, the itinerary of our adventure was quite well planned including the transfers from the Ovda airport, which is in the middle of the Negev desert. We decided to take Egged bus to go to Eilat. We arrived on Saturday afternoon, which meant that the Shabbat was almost over, but even if you arrive earlier on Saturday, no worries, there will always be an Egged bus waiting in front of Ovda airport terminal, because the service runs all week long. For details about the route of the bus and ticket options, hit this link. There is always more to read: Forget Disneyland, go to Parc Astérix! The driver was asking the passengers, which hotel they go to or at which stop they want to get off. The terminal station of the bus is the Israeli – Egyptian border crossing in Taba. The bus does not stop at all the stations, so make sure to check with the driver where you want to get off. If you plan to take the bus on the way back too, arrive well in advance at the bus stop, because it is very hard to estimate when the bus will come as there is no fixed timetable. The safe option is to go to the Eilat central bus station because the bus stops there for sure. The nice thing about Israel is that nearly everybody speaks English, so do not be scared to approach people with inquiries. They are very helpful too. You will need the local currency to buy the bus ticket. You can either change your money for Shekels (NIS) at the airport or withdraw from an ATM there or even better, try to change some of your money at home before departure. There are many car renting companies in Israel. There are branches of the traditional rentals such as Sixt, Hertz, Budget or Avis. We decided to go for the local car rental – Eldan. It fitted our limited budget for the Israeli trip, and the recommendations in the reviews were overly positive. Our little but very cute rental car. 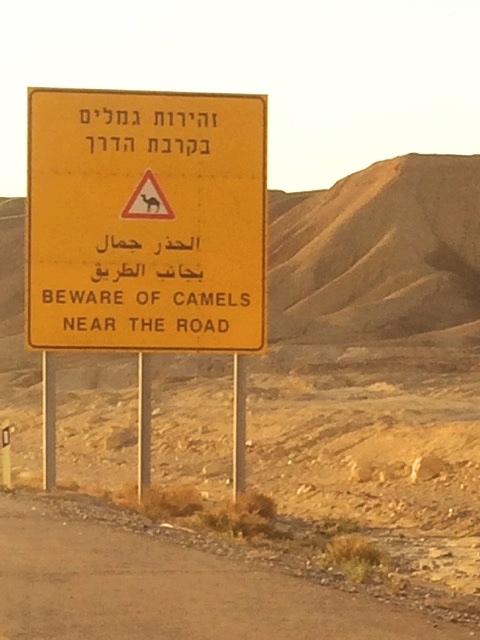 Riding it through Israel was fun, especially in the desert. I liked the branding of the car as it from the distance screams the word “TOURIST” loudly so in my simple touristy mind, this is a safety precaution. To be recognised as non-local can actually in some situations come in handy (and there were such, stay tuned for it). Bear in mind that if you plan to go to Petra, Jordan, you cannot cross the border in a rental car. 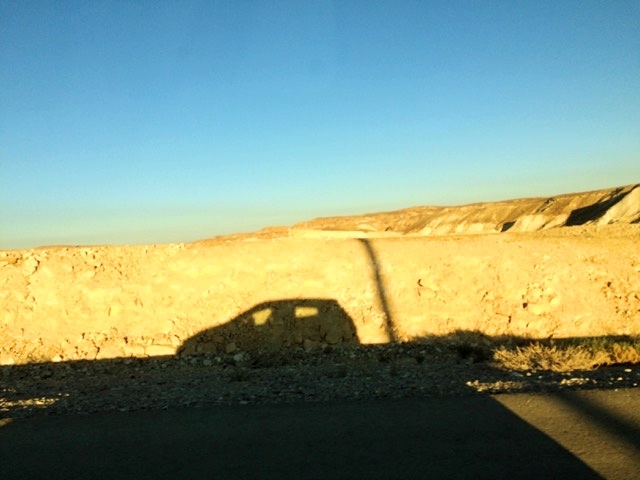 More about renting a car in Israel and general driving tips will be coming in a separate post. Check if you need a visa before your trip to Israel. After arrival, you will pass through the border control. Be prepared to answer questions such as where are you going, what is your holiday plan and if you are going to meet with any locals. On the way back, I was quite surprised about the thoroughness of the control. First, your dangerousness is assessed, then you go to a next station where we got separated as a couple and were asked some confirming questions individually to verify if we are truly a couple. They asked us also routine questions what we did and when we said we rented a car and made a road trip, the officer seemed to be more than satisfied. Be prepared to arrive well in advance as the procedures can take quite a lot of time. This applies especially if you fly from Tel Aviv. 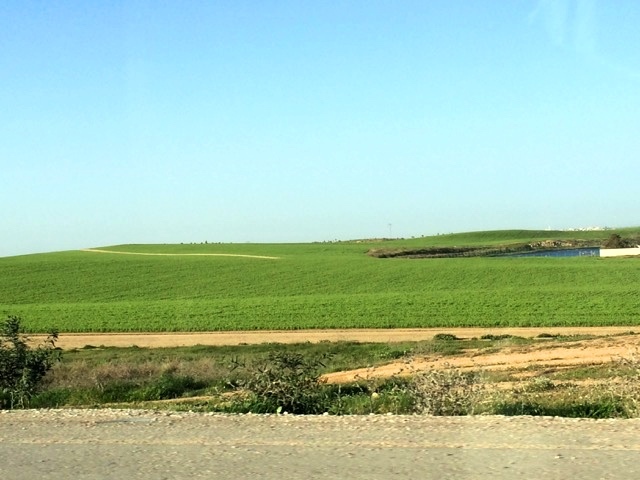 Many faces of Israel – it can be an arid desert but also a blooming field with the greenest green ever. Israel is not Europe, and I got assured about this throughout the entire stay. One of the last realisations was that nobody took away from me a big packaging of sunblock that I had to buy as the sun was sharper than I expected and I turned into a lobster already after the first day. In Europe, you can fly only with containers with the maximum volume of 100 ml. My 300 ml suntan cream would certainly not make the cut when travelling just with a carry-on. A nice and pleasant surprise. There are surely lessons we can learn from Israel. Short overview of how airport security looks like in Israel in this video. Going to Petra or not? If you are already in the South of Israel, going to Jordan to see Petra, the New7Wonder of the World and a UNESCO heritage site, which is described as “one of the most precious cultural properties of man’s cultural heritage” is maybe worth it. Why do I say maybe? Because visiting Petra is not particularly cheap. You can get on an organised tour, pay 1475 NIS (338€, 381$, 269£). The tour has a slight disadvantage: you will spend more time sitting on a bus than wandering around Petra and beware, the tour cost does not include additional visa and border fees. You can find everything about these charges on this website. In 2016, the border crossing fee was 101 NIS per person (24€, 26$, 20£ – you can pay it in a post office or online, too!) and one-time entry visa to Jordan for 30 days costs 40 JOD (50€, 56$, 42£). Alternatively, you can go solo without an organised tour. In this case, it is better if you stay overnight close to Petra as it will get cheaper for you to enter if it is for multiple days. Getting to Petra might be a bit of trouble, and you still have to pay all the border crossing fees. If you want to do Petra on really cheap, try finding other people that you can share the cab from Eilat to the border and after you pass the border control from the crossing to Petra. This should cut on the cost significantly. You cannot rent a car and take it across the border, so this option is out of the question. Still, as much as I would love to visit Petra, it was just simply too expensive (given we were still riding around Israel for a week) so we ended up dropping the idea. The lowest we could get with the price was around 300$/person for two days, which is almost a month apartment rent in Budapest. Certainly something that you have to give up with bleeding heart if you travel Israel on a budget. Hope I will get a chance to visit Petra one day. If you are interested in other details about border crossing in Israel, read this article, it is quite useful. These signs were all the time by the road. However, did we see any camel? Come back to find in the next posts about this road trip to Israel. If you set off on a road trip, planning in advance is a must. I spent a month or so preparing this adventure: reading all possible and impossible articles about places in Israel, looked into Petra options to find out how to do it the cheapest possible (and give up on the idea), and read through the forums to get a gist of how it feels to travel around Israel. Thanks to this thorough planning, the journey was very enjoyable, and if it was up to me, I could stay weeks, months longer, because I had the feeling that there is so much more to explore when I was getting on the flight back to Europe. To bring you the full story, I will cover destinations separately. So stay tuned for the next articles to come or simply join my email list to receive it to the mailbox at the moment I hit the publish button it. When I was researching keywords for this article, I discovered that people quite often search for, which continent is Israel in or even more simply where is Israel. To satisfy them, Israel is in the Middle East, and it neighbours with Egypt, Jordan, Syria and Lebanon. The Mediterranean sea washes most of its shores, which means that if you swim in Croatia, you share the sea with the Israelis too. Cool, right? However, back to the road trip through Israel. 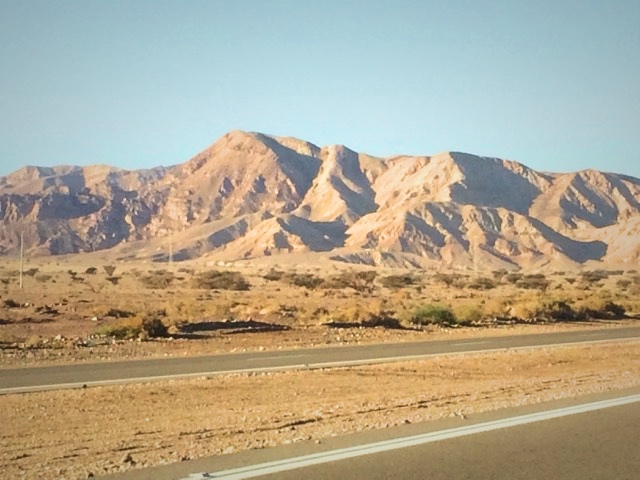 This is our 8-day itinerary that includes hanging around Eilat and the coral reef, hiking in the Mitzpe Ramon desert crater, bathing in the Dead Sea, climbing Masada, exploring Jerusalem, strolling around Tel Aviv and a ride back to Eilat. More about these places in Israel and our Israel holiday in posts to come.